Are Sources Ever Really Exhausted? An email from a blog reader a little over a week ago got me wondering. How many valuable records are there out there that we don't search for because we don't know they exist? A number of years ago I discovered the Minnesota Historical Society has a collection of papers from James A. Smith, my husband's ancestor. It was an exciting find and I immediately called to see if I could get photocopies of everything in the file. I gave them my debit card number and waited for the envelope. Nothing came and I thought, "Oh, well." And then a box arrived--a box with three or four inches of paper and a receipt for more than I usually pay for a week's worth of groceries. I was a bit poorer than I had expected to be but I was elated. Most of the papers documented activities of the Northwest Fur Company in the mid-1860s (James was a partner) but there were also some land records and other miscellaneous items. A few years later I was able to go to the Minnesota Historical Society in person and I found myself with a few extra hours at the end of my visit. I asked for the box of James A. Smith papers thinking that it would be fun to see the original documents. Looking through the files I noticed a folder with family letters. Family letters? When I got my bearings I realized that the folder contained correspondence between my husband's ancestor and his ancestor's brother--letters written in 1835 at the time that James A. Smith first came Chicago. Those letters hadn't been included in the box of photocopies that I'd received and they answered many of the questions that I had about the Smith family's decision to settle in the west. Finding those documents was moving and memorable. 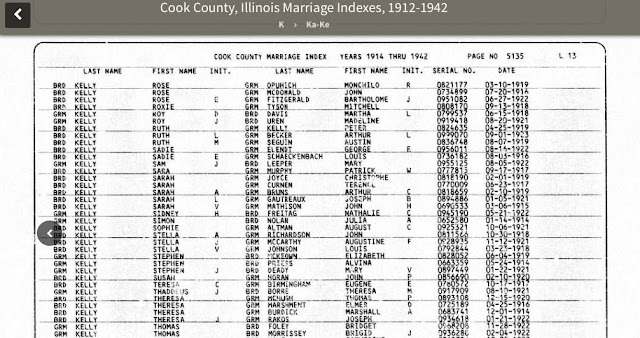 Last week I heard from a researcher, Elliott Malkin, who had a similar Chicago-related experience. He had researched his great-grandfather's life in depth and thought that he had exhausted all of the available sources until he received an email from the granddaughter of his great-grandfather's third wife. It's a great story and I asked him if I could share the link. Read Hyman Victor Revisited. 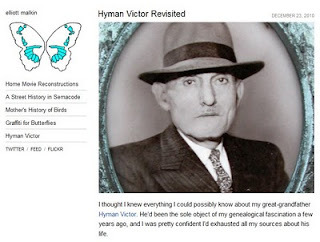 It's a wonderful example of genealogical serendipity and collaboration. And then, once you've finished the blog post, click on the "my website about his life" link to visit the website that Mr. Malkin created to document his grandfather's life. It's a very nicely done.